FBI Director James Comey released a statement today saying that the FBI is going to continue the previously closed investigation into Hillary Clinton's emails from her time as secretary of state. Comey also sent a message to FBI employees about the letter to Congress, saying, "the investigative team briefed me on their recommendation with respect to seeking access to emails that have recently been found in an unrelated case. Because those emails appear to be pertinent to our investigation, I agreed that we should take appropriate steps to obtain and review them." He added in the text obtained by ABC News: "Of course, we don't ordinarily tell Congress about ongoing investigations, but here I feel an obligation to do so given that I testified repeatedly in recent months that our investigation was completed. I also think it would be misleading to the American people were we not to supplement the record. At the same time, however, given that we don't know the significance of this newly discovered collection of emails, I don't want to create a misleading impression. "In trying to strike that balance, in a brief letter and in the middle of an election season, there is significant risk of being misunderstood, but I wanted you to hear directly from me about it." Republican Rep. Robert Goodlatte, who is the chairman of the House Judiciary Committee, issued a statement in response on Twitter. Today's news comes nearly four months after Comey announced that no charges would be filed against Clinton over her use of a private email server while she was Secretary of State. "Although there is evidence of potential violations of the statutes regarding the handling of classified information, our judgment is that no reasonable prosecutor would bring such a case," Comey said on July 5. He said that while they could not "find a case that would support bringing criminal charges on these facts," he did call Clinton's actions "extremely careless." The lack of charges surrounding the use of the private email server has been an important campaign issue for Republicans, and House Speaker Paul Ryan was one of the first to release a statement. Donald Trump opened a campaign rally in Iowa tonight saying the FBI would never have taken this route unless they had evidence of a "most egregious criminal offense. Justice will prevail." Earlier in New Hampshire, shortly after the release of the FBI letter, Trump announced the news to cheers at a rally there. Clinton was on her campaign plane headed to Iowa when the news broke, but there was no internet available on board so no one knew about the announcement until a reporter briefly received service. Clinton spokesman Nick Merrill was asked about it and seemed shocked. One top aide told ABC News that he was learning about everything in real time upon landing in Iowa. In a brief news conference this evening, Clinton called on the FBI to release all the information it has in relation to the newly discovered emails that prompted the bureau's latest review. Clinton campaign chairman John Podesta released a statement calling for Comey to "immediately provide the American public more information" about the reason behind today's announcement. "Director Comey's letter refers to emails that have come to light in an unrelated case, but we have no idea what those emails are and the Director himself notes they may not even be significant," Podesta's statement reads. 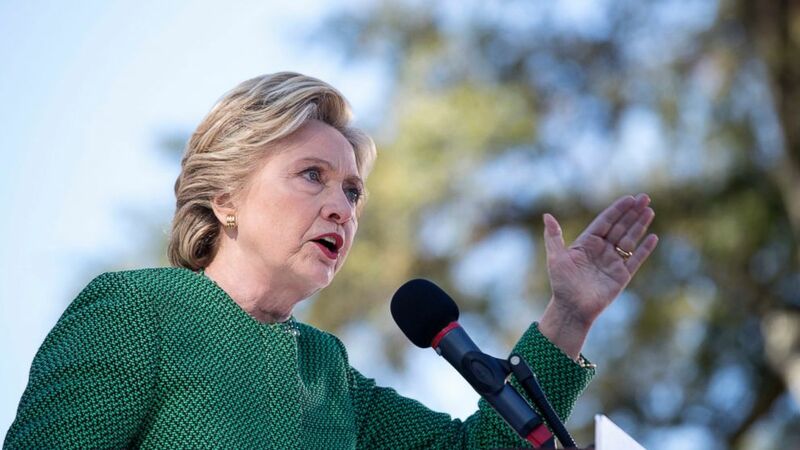 Clinton made no mention of the investigation at both of the campaign rallies she held in Iowa after the news broke. And during an interview with CNN Friday, Vice President Joe Biden said the FBI should release the newly-discovered emails. He also shared his feelings about Anthony Weiner, saying "I'm not a big fan."